Air core coils are the highest grade coils. Higher frequencies are travelling on the surface of a conductor. This is called skin effect. Stranded wire has a higher surface than solid wire. The skin effect is here less predominant. The coil has a polycarbonate bobbin. 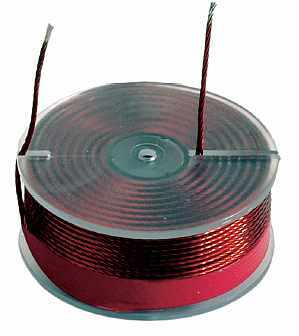 The Tritec air core coil features 7 concentric stranded wires. These wires are twisted; available in 3 wire diameters. In the table belowis: 1st line: 7x0,5 mm; 2nd line: 7x0,6 mm; 3rd line: 7x0,8 mm. If you want to use the tritec (or hepta) wire for your applications we deliver it with transparent PVC insulation.